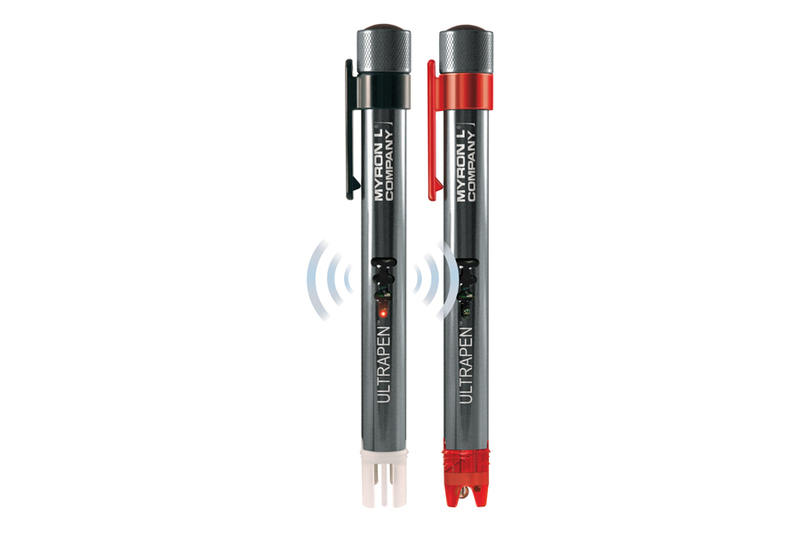 The Myron L Co.’s Ultrapen PTBTx wireless pocket testers are designed to be paired with any Apple iOS 8+ device via the Ultrapen's Bluetooth BLE transceiver. A free app takes advantage of Apple's iOS graphical user interface to provide easy-to-read displays and a simple-to-use interface. The Bluetooth link means that there are no wires getting in the way when moving quickly between samples and that paired mobile devices can be held safely away from liquids. Advanced features include: automatic temperature compensation; stable microprocessor-based circuitry; user-intuitive design and a rugged, waterproof housing. The PTBT1 model measures conductivity, total dissolved solids, salinity and temperature with three, selectable solution modes that model commonly encountered water types. The PTBT2 model measures pH and temperature with one-, two- and three-point calibration options. With the Ultrapen OS app, each Ultrapen PTBTx can be given a unique name stored in the Ultrapen’s memory so it is easily identifiable no matter what mobile device is used. Measurement locations can be programmed as GPS locations that are automatically selected when the user is close to a specific measurement local, or non-GPS locations, which are ideal for applications where the sample sites are too close together for the GPS to discriminate. Through the app, items such as Ultrapen settings, sample temperatures, Ultrapen name and measurement locations can be saved to the mobile device's memory. Records can be exported via the mobile device’s email function as either .csv, .xls, .xlsx formatted files or using Myron L Co.'s .mlc, proprietary, encrypted format. Stored measurements can be sorted or filtered and then emailed or deleted without affecting other records stored in the memory. The PTBT3 with ORP and temperature measurement, PTBT4 with free chlorine equivalent and temperature measurement, and an Android-compatible app are all coming soon.